and shines down upon us to let us know they are happy. 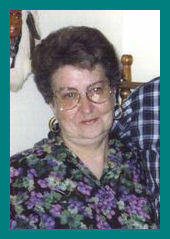 resident of Wyandotte, died Sunday, January 2, 2011 at her home surrounded by her family at the age of 78. She was born on January 22, 1932 in Fairland, Oklahoma to Charley Mathis and Blanche Collison. She was the 6th child of 8 children. Vera lived most of her life in the Wyandotte area except for a short time in Hood River, OR. Vera graduated from Wyandotte schools, where she was a proud member of the Wyandotte Bears girls basketball team. On June 22, 1951, she married Norman Clark Frazier (Sass) in Miami, OK. They had 4 children. On May 18, 2000, Vera married (tribal member) Harold D. Smith of Hood River. Vera was preceded in death by a daughter, Naomi Jean Frazier on October 15, 1955; first husband, Norman C. Frazier on February 9, 1995 and her second husband, Harold D. Smith on September 15, 2010; her parents Charley & Blanche; 3 sisters, Dora Roberts, Evelyn(sis) Francisco, Joann Cline; 2 brothers Gene Mathis, Basil Mathis. She is survived by sons, Darrell E Frazier, of Wyandotte OK, Norman Dale and Anita Frazier of Wyandotte OK; daughter, Brenda M. and Gene Brock of Fairland, OK; stepchildren, Betty Wollam of Milwaukee, OR, Sherri Taylor of Portland OR, Harold Smith Jr. of Hood River, OR; grandchildren, Ashley R. Frazier of Vinita OK, Dala Mae and Shawn Davis of Grove OK, Dylan Clark Brock of Fairland, OK, Kim Zurbay of Wyandotte OK; 2 great-grand children Daelyn Frazier of Vinita, OK, Nick Zurbay of Wyandotte, OK; 2 sisters, Tooter Brumfield of Montana and Syliva Bingman of Idaho; 1 brother Leon Mathis of Grove OK, and many nieces and nephews.